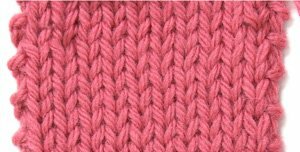 When knitting, you may notice that the first and last stitches on the sides of your piece look uneven and stretched out. There are many ways to handle these stitches so that the edges are more attractive and easier to seam. Some people choose to slip the first stitch purlwise on every row, some choose to knit the first stitch of every row. The most important thing is to be consistent. Some examples are illustrated below in stockinette stitch fabric. This entry was posted in Reference, View All by Knit Picks Tutorials. Bookmark the permalink.